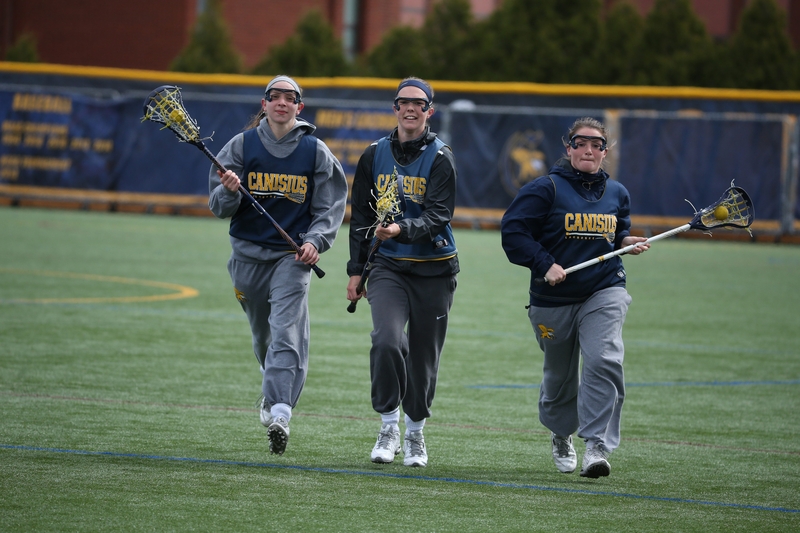 Canisius women’s lacrosse players (left to right) Tori Greco, Erica Evans and Tori Quinn are gearing up for another MAAC Tournament. Late in the fall of 2002, Tim Dillon had a dilemma. The spring season was approaching, and he didn’t have a women’s lacrosse coach at Canisius. It wasn’t what you would call a plum position. In five years of existence, the Golden Griffins had won a total of two games in the Metro Atlantic Athleic Conference. Dillon felt Scott Teeter would be ideal for the job. Teeter, who had finished a four-year hockey career at Canisius the previous year, had been a student assistant for the women’s lacrosse team. He had also been an assistant at Buffalo State as a senior. Teeter still had the hockey dream, or so he thought. He had just been released by the ECHL team in Wheeling, W. Va. But he had an offer to play pro hockey in the Netherlands. He was planning to take it when he ran into Dillon at a Canisius dinner on a stop back through Buffalo. “I need to talk to you right away,” Dillon said. Dillon wouldn’t take no for an answer. He handed Teeter a folder with a formal proposal, which would make him the part-time coach in 2003 and full-time the following year. Five women from the lacrosse team cornered him and essentially interviewed him for the job. Teeter went home to Shelburne, Ont. After dinner with his parents, he handed the folder to his father, Lee. He told him he wasn’t taking the job. His dad, who owns a trucking company, perused the offer. He scratched his head and put the folder on the table. “What do you think, Dad?” Teeter asked. This was a future, an opportunity, a chance for stability. His father knew how other hockey players had bounced around the minors, spinning their wheels. Scott was already 25, too old to be a prospect. The dream was fine, but Canisius was offering a career. That was that. Teeter never got on the plane for Holland. He took the job. It turned out to be the best thing that ever happened to him, and to women’s lacrosse at Canisius. Oh, it wasn’t easy. There were times when Teeter wondered what he had gotten himself into. In his first two seasons, the Griffs went a combined 1-24. They were 0-12 in the MAAC. But things were getting better. Teeter, who had played high school lacrosse in Canada, was teaching and learning at the same time. He watched other Griffs coaches – Mike MacDonald, Terry Zeh, Mike Rappl – run practices and applied some of their methods to women’s lacrosse. In his third year, the Griffs finished 9-6. In 2006, they lost in the final of the MAAC Tournament. They were no longer a joke, but a rising conference power. Teeter tapped into Canada for recruits and became its Under-19 national women’s coach. Today, Teeter presides over a dynasty – the most successful college sports program, men’s or women’s, in Western New York. Canisius has won four consecutive MAAC Tournament titles. Next weekend, as regular-season champion, it will host the conference tournament at the Demske Sports Complex, looking to capture a fifth straight championship and a trip to the NCAA Tournament. Keeping his players grounded is a big part of Teeter’s job these days. When you’ve known nothing but success, it helps to be reminded about 1-24. It’s important not to take winning for granted. Teeter can be tough when it’s warranted, but it’s not much trouble keeping his players hungry. He said most of them are perfectionists. The school compliance officer came on a road trip and was amazed to find most of the women watching game film on their laptops. The Griffs are accustomed to winning, but they have bigger goals. They want to set the bar higher by winning a game in the NCAA Tournament, a goal that has eluded them in four tries. Twice, they lost by one goal to a team ranked in the top 15 in the country. They also feel a duty to uphold the high standard established by the women who came before them, the ones who helped build a bad program into a mid-major model. Quinn doesn’t have to look far for a reminder. Her sister, Carly, was a captain and star for Teeter’s first two MAAC champions. Carly, who graduated in 2012, held the school’s career scoring record until this season – when Tori broke it. Teeter’s world got a little bigger a month ago when he and his wife, Jennifer, became parents for the first time. He missed his first game in 13 years when his daughter, Olivia, was born. The Griffs are 8-0 since Olivia was born and have won a team-record 10 in a row overall. Teeter said things began to take off for his program when he realized that female athletes want to be treated like the men. They might ask more questions and demand more honesty from the coach, but otherwise there’s no difference. They want to get better, and they want to win. That means maintaining an edge and aspiring to a higher standard. They’re a target, and they know it. “The bull’s-eye is huge on your back,” Teeter said. “Anything you win, it just gets bigger. We’re probably the most hated team in our conference – because we win. It’s not that we do it disrespectfully. But we win.